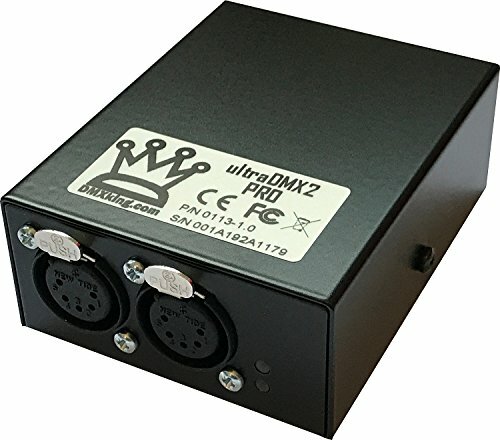 The ultimate USB DMX box with more features than anything else on the market. From basic Enttec Pro compatibility mode right through to full on Art-Net/sACN we've got everything covered including standalone show playback of any complexity and duration. Supporting both DMX512 output and DMX512 input individually configurable on each channel along with Art-Net and sACN protocols the ultraDMX2 PRO is the perfect choice for small to medium rigs. DMX merge functionality works from both Art-Net/sACN, DMX Input and USB DMX sources providing plenty of configuration possibilities. Designed and manufactured in New Zealand to the highest standards. Compatible with ENTTEC Pro over USB, and Art-Net I, II & 3 and sACN/E1.31 protocols over ethernet. Configuration utility for both Windows and OSX. 1500V Isolation between every port. Tough metal enclosure. Firmware upgradable.